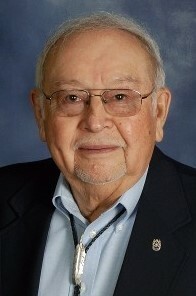 A memorial service for Ira George Salvini, Sr., 84, Lawrence was held Saturday, February 2, 2019, at Coffin Sports Complex, Haskell Indian Nations University in Lawrence, Kansas. He began his journey to the spirit world on Sunday, January 13, 2019, at his home. He is a proud Paiute Tribal Member/Native-Indigenous American. Ira was born on February 28, 1934, in Wichman, Nevada – the son of Hazel Thompson and Lee Salvini. Ira was born at home, grew up in the Smith Valley, Yerington, Pyramid Lake, and Schurz reservation areas. His mother, Hazel died in childbirth with Ira’s third brother. He and his brother, Gino, were raised by their grandmother, Louisa Thompson, and Aunt Jane Thompson. Following a tragic automobile accident, Ira and Gino were sent to the Stewart Indian Boarding School. When the brothers arrived at Stewart, they were fluent Paiute-only language speakers. Ira was released from the boarding school to a foster family in Fernley, Nevada where Ira was an outstanding football and basketball player. His football coach introduced him to Haskell Institute in Lawrence Kansas – and helped prepare him to attend after graduation from Fernley in 1954. Ira studied auto mechanics at Haskell and graduated in 1956. He then served in the military (Army), stationed at Fort Riley and fought during the Korean War. He remained active with the Army Reserve in Lawrence for many years. After his service at Fort Riley, he moved to Pyramid Lake Reservation in Nevada with his family to begin looking for work. Haskell Institute asked him to return to teach Auto Mechanics in 1960. His family moved back to Lawrence where he was an Instructor in auto mechanics for many years while achieving a university education and at the end of his time at Haskell had become the Associate Dean of Business/Industrial Arts. He retired in 1989. After retirement, he began his work with the Environmental Protection Agency as a Tribal Liaison. Ira was passionate about his work with the EPA, the tribal members/leadership he worked with and truly valued his colleagues at the EPA. He retired in 2014 at 80 years of age. Ira graduated from Pittsburgh State University with a Master’s and Specialist degree in Industrial Education in 1974 and continued studying at the University of Kansas, in Education, ABD in the Ph.D. program. Ira also worked on the weekends to support his family at Potter’s 66 Filing Station and valued his friendship with Don Potter and his family. Ira was a long-time member of the First United Methodist Church in Lawrence. He was a long time member of the Haskell Alumni and was awarded Outstanding Alumni of Haskell in 2001. Ira deeply loved and cared for his children, grandchildren, and his great-grandchildren. They were his world. Supporting all of his children was his true passion and his greatest gift to them. Ira was a stranger to no one. He was generous, kind, spiritual, reliable, loving, engaged with his family, active with his Paiute traditions, supportive, full of so much love, compassionate and so respected by all. Ira married Barbara (Giddens) Salvini in Lawrence in July of 1956. They divorced in 2000. Survivors include Tonia Leah Salvini, daughter, Lawrence; Ira George Salvini, Jr., Son, Hillsdale Lake; Grandchildren: Lauren Ballard (Baby Mae)/Caitlin, Brandon Salvini, Maggie Salvini, and Emma Salvini (children of Hiram Ashley Salvini/Michelle); Samantha Taylor/Joel, Sarah Salvini (children of Ira George Salvini, Jr./Lynn) and Hallie Kastanek/Lindsey and Hahna Lee (Baby Lukah) (children of Tonia Leah Salvini/Charles Lee). Ira was preceded in death by his son, Hiram Ashley Salvini, his brother, Gino Salvini, his mother, Hazel Thompson and father, Lee Salvini. His Paiute relatives in Nevada and California are also survived: Lorenda Sanchez, Billie Hicks, and Leah Borden. Nieces/nephews: Greg Rupert, Anna Rupert, and Marty Rupert, Carson City, NV. Memorials can be made in Ira’s name to the Hiram Salvini Scholarship Fund/Haskell Indian Nations University through the Haskell Foundation. They can be sent in care of Warren-McElwain Mortuary, 120 W. 13th Street, Lawrence, KS 66044. Another opportunity for contributions in Ira’s name can be made at the time of the memorial service.